If you have notpersonally experienced the evolution of VMware’s product history, you might struggle to gain a perspective on their product portfolio. The virtualization specialist has expanded its product line considerably in recent years, especially in the area of data center/private cloud solutions. In this article, I look at a few of the VMware cloud tools and review some updates to VMware standard services and software. VMware may well have grown gradually into the company it is today with virtualization solutions such as ESX/ESXi and VMware Workstation, but for some time, its core business has been data center virtualization with vSphere, which allows extensive automation of data centers. Some time ago, however, the competition between virtualization platforms shifted from hypervisor level to interoperable management solutions, which requires support for rival hypervisor systems and, as a general rule, leading manufacturers of cloud APIs. The company recently surprised everyone by announcing a hybrid cloud solution under the name “VMware vCloud Hybrid Service” that targets established products from leading manufacturers (e.g., Amazon Web Services, Google Compute Engine, Rackspace, Microsoft Azure). The service is now available in the US as part of the Early Access Program, with a plan for it to go on general sale in 2013Q3; the rumored release date for Europe is 2013Q4. VMware wants to sell its new service exclusively through partners so that customers can choose between two variants with differing features, such as the number of virtual CPUs (vCPUs), amount of virtual memory (vRAM), speed of the network connection (bandwidth), and contract duration. Thus, the vCloud Hybrid Service Dedicated Cloud provides physically isolated and reserved computing resources at an annual cost starting from 13 cents per hour for a fully protected, fully redundant 1GB virtual machine (VM) using a processor. The vCloud Hybrid Service Virtual Private Cloud, however, is a multiclient-capable computing resource allocation model with specific customer allocation. For this product, you will be billed from 4.5 cents per hour on a monthly basis for a fully protected, fully redundant 1GB VM with a CPU. The special feature of VMware’s Public Cloud Solution is seamless integration with existing solutions and management tools, meaning that vSphere administrators, for example, who already use vSphere servers can monitor, manage, and migrate VMs from the vSphere client using the freely available vCloud Connector plugin (Figure 1). Figure 1: The vCloud Connector establishes the connection between data center/private and public cloud (from vmware.com). The vCloud Hybrid Service, like all other VMware cloud concepts, is based on vSphere but benefits in a particular way from its advanced features, such as vMotion, high availability, and the vSphere Distributed Resource Scheduler. According to VMware, this guarantees the highest possible reliability for critical business applications in the cloud with automated replication, monitoring, and high availability, as well as a similar level of performance as in their own data center – without the need for companies to rewrite their applications. This property is called VMware “application neutrality.” The vCloud Hybrid Service supports thousands of applications and more than 90 operating systems certified for vSphere. Companies can also securely extend Layer 2/Layer 3 networks existing in their own data center to vCloud Hybrid Services via VPN. For this, you need the same management tools and network and security models that VMware customers also now use for their on- and off-premises environments. Recent strategically important acquisitions include those of Integrien and TriCipher at the end of 2010, which incorporated VMware’s product and technology portfolio and the self-learning analysis function AliveVM. California company Integrien develops real-time performance analysis software for applications and infrastructure that, in due time, was integrated into VMware’s vCenter Manager. The acquisition of DynamicOps did not occur until Summer 2012. The company specializes in the development of cloud automation solutions that enable the provisioning and management of IT services across heterogeneous environments, such as VMware-based private, public, and (now) hybrid clouds, as well as physical infrastructures, multiple hypervisors, and Amazon Web Services (AWS). As VMware bundles its management tools into the new vCloud Suite, experts will have to get used to a new style. The package includes the complete product range for service provisioning and operations management and exists in a Standard, Advanced, and Enterprise Edition, among which VMware divides the tools included in the various editions roughly into “cloud management” and “cloud infrastructure” sections. Besides the vCenter Site Recovery Manager for automated planning, testing, and execution of disaster recovery, all vCloud suite versions include the complete “cloud infrastructure” stack with vCloud Director (Figure 2), based on vSphere virtualization. Figure 2: vCloud Director is the hub of the VMware cloud stack and creates a pool of freely distributable cloud resources from virtualization resources (from vmware.com). Also included are the vCloud Connector and vCloud Networking and Security Suite, which among other things is responsible for providing security and availability. The Advanced and Enterprise Editions of vCloud Suite also include the vCenter Operations Management Suite in different expansion stages, such as for monitoring, performance management, and capacity management (Figure 3). 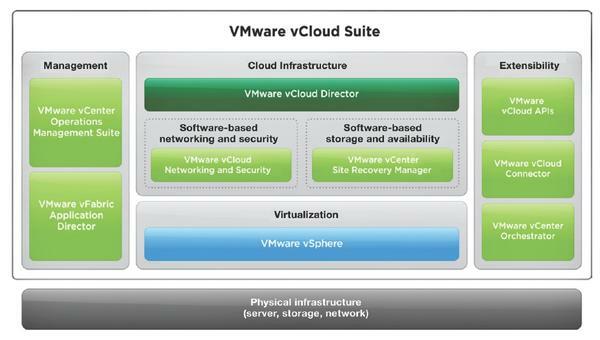 Figure 3: vCloud suite architecture (from vmware.com). The Enterprise edition also includes the vCenter Site Recovery Manager, vFabric Application Director, and vCloud Automation Center. For the first time, the Enterprise version of vCloud Suite supplements the standard tools for cloud infrastructure and operations management with tools for automated provisioning, thanks to vFabric Application Director and vCloud Automation Center. The vFabric middleware suite, consisting of Data Director, SQLFire, GemFire, PostgreSQL, and RabbitMQ, serves as a run-time platform for Java Spring applications. Technically, the Java platform optimized for the Spring Framework consists of an extension for the Tomcat Java application server and vFabric Elastic Memory for Java (EM4J), and a vFabric HTTP server, a commercial variant of Apache. The vFabric Application Director lets you assemble a virtual machine for multitier applications and lets users freely combine all the necessary components (e.g., operating systems, middleware, databases) via drag and drop. Each of the configurations created in this manner can be saved as a blueprint so that other users can produce additional instances of the application when needed. For the first time, the new version 5.0 of vFabric Director is no longer limited to Linux and now also allows Windows configuration, including desired programs such as SQL Server, Exchange, or SharePoint. Compared with other providers, VMware vFabric Application Director allows you to model applications to suit other infrastructures, such as AWS. The new vCloud Automation Center is responsible for provisioning. The software provides users with functions for requesting and deploying IT resources. This means that authorized users can order desired services and benefits single-handedly using a Self-Service Portal. The software can also track down and, when necessary, recall resources that are no longer needed. It’s not just about the provision of vSphere resources, logical partitions, or other virtual infrastructure components furnished with the vCloud Director. In addition to physical hardware, the software also supports foreign hypervisors (KVM, XenServer, Hyper-V) and cloud APIs, such as AWS. vCenter Operations Management Suite is also part of the management stack and is included as a component in the Advanced and Enterprise editions of the vCloud Suite. VMware has comprehensively reorganized this in recent months, so that the set of tools included in the various editions no longer corresponds to that with which most users are familiar. The most prominent new addition to the Advanced and Enterprise editions of the management suite is the aforementioned Hyperic, which monitors hardware resources, operating systems, and applications. Hyperic implemented performance monitoring first for applications. vCenter Operations Management Suite, which is also available in the Foundation and Standard versions is part of not only the vCloud suite, but also vSphere with Operations Management. All in all, the suite contains all the tools needed to manage dynamic infrastructure; in addition to the described observation and monitoring tools, it also includes tools for checking compliance and for capacity management, including the detection of performance bottlenecks. Specifically, the suite contains vCenter Operations Manager tools, vCenter Configuration Manager, vFabric Hyperic, vCenter Infrastructure Navigator, and vCenter Chargeback Manager. However, the aforementioned performance monitoring at the application level is only possible after the integration of vFabric Hyperic 5.6.
vCenter Operations Manager provides extensive reporting and analysis functions by way of the vCenter Configuration Manager, which integrates all the parent company’s Ionix tools into the management suite. The vCenter Infrastructure Navigator, responsible for a graphical representation of the virtual infrastructure, and the vCenter Chargeback Manager, which is used for an individual calculation of the resources used, still remain. The addition of Hyperic to the Advanced and Enterprise versions is, like the loss of the former Enterprise Plus version, part of the restructuring of the vCenter Operations Suite carried out in the last few months, wherein the former advanced functions apparently made their way down to the “next smaller” version. For this reason, the Advanced Edition is equivalent to what was formerly the Enterprise Edition, the Standard Version to the former Advanced Edition, and the Foundation version to the old Standard version. Users of all vSphere versions with an active support contract (vSphere with Operations) can freely download the new versions. Both lower versions only contain the vCenter Operations Manager which essentially serves log analysis and monitoring. The vCenter Site Recovery Manager is VMware’s disaster recovery solution that allows VMs to be transferred between data centers. The software can help recover virtual infrastructures after a failure or migrate applications to another data center. The Site Recovery Manager also supports automatic failover to other sites and even restores all environments with the help of specific recovery plans. It also works with storage or host-based replication. VMware only introduced the latter with vSphere 5. In the current vSphere version 5.1, host-based replication can be used directly from the vCenter manager without Site Recovery. This means that from vSphere 5.1 onward, the base system offers a simple disaster recovery option. VMware also still offers a tool suite in the management tools area, operating under the names IT Business Management, but not as part the vCloud Suite. The current suite version 7.5 is designed to support companies by measuring the quality and cost of their private cloud. Therefore, the “IT Benchmarking” module it contains allows a CIO to compare their department’s performance with other IT organizations with the help of a series of key figures. All remaining tools used for an array of different tasks are gathered under the name “Cloud Infrastructure.” Some of these tools are well known to users, but a few are new, including tools to integrate vSphere resources into logical data centers. The basis of all features in the VMware cloud stack is vSphere, the software for virtualizing data centers, which in turn is based on the ESXi hypervisor and allows complete remote administration via a SOAP API with the aforementioned tools. In the vSphere virtualization concept, the ESXi systems, physical hosts, and storage resources form a resource pool from which the required data center workloads are dynamically allocated in the form of virtual machines or clusters. For example, ESXi hosts provide VMFS (virtual machine filesystem), which is normally used with shared storage (NAS/SAN). In vSphere, VMware distinguishes between the editions of vSphere with Operations Management, all of which are administered through a vCenter server and are used as the foundation of data center virtualization and the pure vSphere Hypervisor, available for free. By the way, there has not been an ESX since vSphere 5.0, just the commercial or free ESXi version. 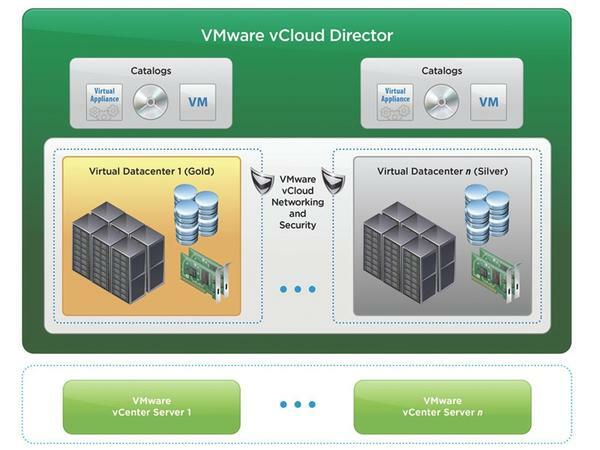 vCloud Director is the component in VMware’s portfolio that divides the total pool of resources into logical units – the so-called “virtual data center,” which in turn can operate dynamically from the pool of virtualized hardware. vCloud Director flexibly allows administrators to map out existing resources to business needs in their IT departments, even while all virtual data centers remain isolated from each other; vCloud Director allows multiclient-capable supervision of IT resources. In turn, vCloud Connector is distributed with vCloud Director and is used in, among other things, the new vCloud Hybrid Service to connect internal and external resources from the public cloud. The product VMware has marketed for some time under the name vCloud Networking and Security, is basically the former vShield, which consisted of the vShield Endpoint, vShield App, and vShield Edge components. Although vShield Endpoint for Malware Defense from vSphere 5.1 is part of the virtualization platform, VMware gathered the remaining components under the new name “vCloud Networking and Security,” which is also available in the Standard and Advanced Editions. Both versions offer firewall, DHCP server, and VPN, but only the Enterprise Edition also supports load balancing and high availability and contains the “Data Security” component that corresponds to the former vShield App with Data Security. This component makes it possible to isolate critical applications in the virtual data center through firewall services at the vNIC level and thus create virtual trust zones that are protected from network-based threats. This function is used to classify data in a virtual machine automatically in order to assign appropriate security policies. Furthermore, as of recently, both versions implement the VXLAN specification developed by VMware with Cisco. In VMware’s data center virtualization, VXLAN serves as a technology for creating flexible and portable virtual data centers through the combination of computing resources over non-contiguous clusters across pools, which then divide again into logical networks and are assigned applications (Figure 4). Figure 4: VXLAN technology allows you to create flexible and portable virtual data centers by combining computing resources via non-contiguous clusters to pools (from vmware.com). VMware’s product consolidation over the past two years was necessary to effect the integration of strategically and undoubtedly far-sighted acquisitions into a clean, coordinated portfolio. The result is quantitatively impressive and covers not only simple administration of virtualized resources but additionally includes a huge range of functions that have gradually come to include platforms from other vendors. The consequence is a level of complexity that complicates the relationships and positioning of the respective tools for VMware professionals. This problem is potentiated because each of the individual suites are available in different editions, in which the tools provided partially overlap. Together with the rich variety of vSphere versions, purchasing a VMware edition has become a science. I cannot determine the extent to which the complexity is by design or just a historical remnant. VMware's recent announcement about vCloud Hybrid Service involves expansion of the vCloud suite toward a public/hybrid cloud. In this article, we attempt to shed some light on the huge number of VMware products. PowerCLI in the current version 6 R3 supports access to nearly all VMware data center and cloud products with around 500 cmdlets, including numerous additional features, APIs, and interfaces. In this article, we show you the most important innovations. In ESXi environments, the powerful Puppet automatic configuration tool can perform its services and roll out VMs automatically. A test environment shows the benefits of Puppet in conjunction with vSphere. We look at VMware's tool for managing and provisioning cloud infrastructures.